Does sethf2012 belong in this group? Yes social I love to social with people, the news, social drinking, hang out, have fun, enjoy it, BBQ, meet new people as general and much more. Does loki333 belong in this group? 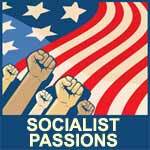 I've been a socialist for 40 years, and I'm still dreaming of a better world (fighting for it too). Looking for someone who also has hope in their heart for conversation, friendship, potentially romance. Does palomino2 belong in this group? I care for the people I'm Jonathan. I believe that Socialist is a good way to be. It provides services for everybody regardless of class. Things like education, healthcare, jobs and housing should be available to everybody. Looking for a practical alternative to capitalism I'm deeply skeptical of this whole free market thing the world by and large has going on. Capitalism helped us get rid of feudalism, so that's good, but I think its usefulness as an organizing principle of society has come to an end. At the same time, I don't see any obvious avenues to get out of it any time soon.